What Is DA 1380 Form? DA-1380 form is a kind of the commonly used military form. It is intended for record of individual performance or reserve duty trainings. Such form is usually completed by the last day of each month in order to cover such issues as non-unit reserve training other than Army Extension Courses and equivalent duty or other duty performed by reservists assigned to USAR units. Form DA 1380 is filled out by the commanding officer of a unit or by the chief of the proponent agency for the project. Sometimes it may be prepared by the reservist. In these cases the reservist fills out all items except for the signature and further gets the document signed by duly authorized official of a unit. 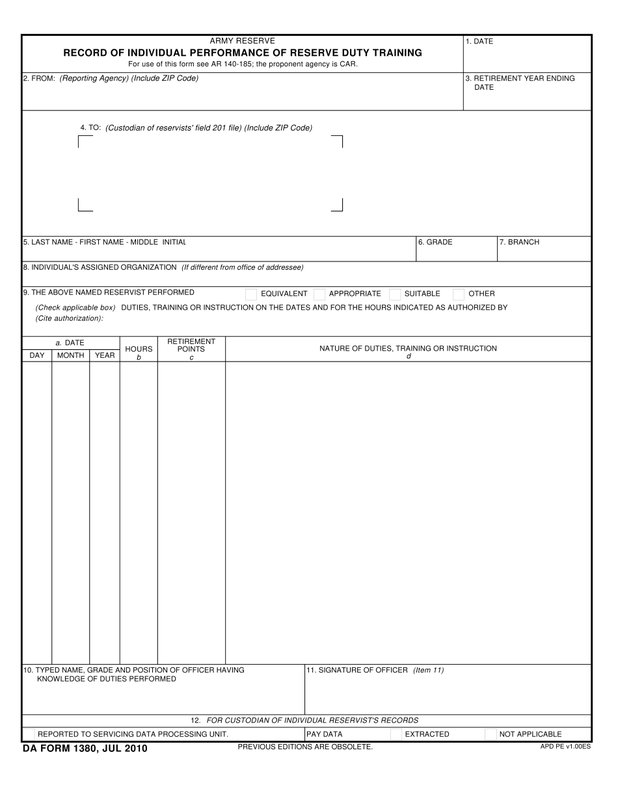 Here find an electronic editable DA 1380 form sample in pdf that can be downloaded on a computer or filled out online in no time. The form consists of two pages. The first page presents the form itself, and the second one provides the instructions. nature of duties, trainings or instruction performed. A final document has to be signed by the officer having knowledge of the duties performed. Customize a document in no time using our various editing tools. Take an advantage of electronic signature by drawing, typing or uploading. Send a final document to recipient or share it online. © 2019 da-1380-form.com. All rights reserved.